But all that bread is heavy, and you know you really should cut back. And the cheese (yes even the Daiya) is full of fat, oil, and extra calories and is definitely NOT helping your waistline….. (and you can never stop with just 2 pieces anyway). This was a totally random, let’s make something new, recipe night. I was thinking about twice baked potatoes or potato skins, but definitely wanted a pizza flavor. Sauce or no sauce? Cheese or no cheese? Baked or nuked? Not really knowing what I was going to do – I grabbed 2 large Yukon Gold potatoes and the rest just kind of happened naturally. 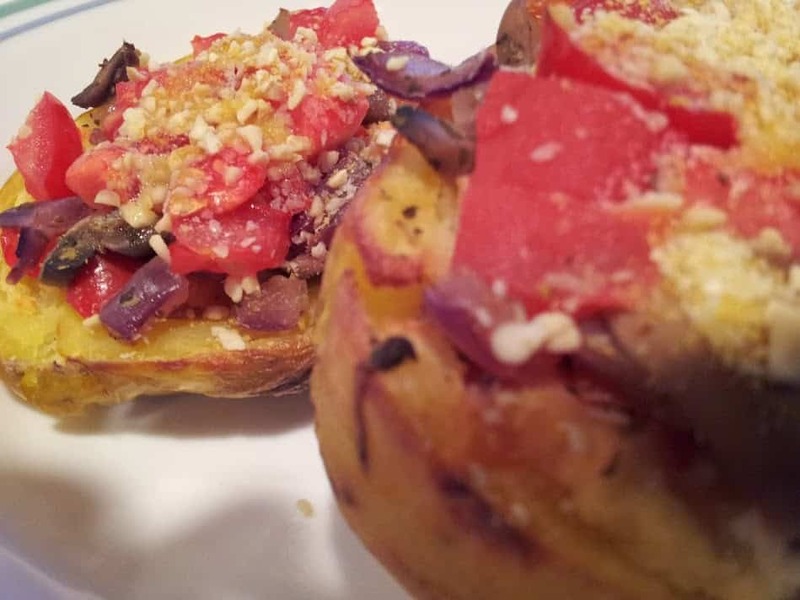 Pizza stuffed potatoes are perfect for a light dinner or snack. You get all the pizza flavor without all the heavy breading and fat promoting cheeses. Wash and dry the 2 Yukon Golds and pierce them several times with a knife or fork so they won’t explode in the microwave. Microwave each potato on high power for 4 minutes. These babies will be hot when done, so carefully place them somewhere safe to cool. Chop half of a red onion and half of a red bell pepper and toss into a small saucepan. Drain and rinse one of those little 4oz cans of mushroom and add that too. Can’t have pizza (or pizza stuffed potatoes) without garlic so smash and chop a clove or two and add that as well. To soften these veggies without burning, add 2 tablespoons of low sodium vegetable broth. Finally add a teaspoon of dried Italian Seasoning and another teaspoon of dried Basil. Heat this mixture on med-low heat until they are nice and soft. Now carefully cut each potato in half lengthwise. Don’t cut them in half . You want two wide and shallow boats compared to 2 narrow and deep ones if that makes any sense. Now using a spoon, carefully scoop out most of the cooked potato leaving about 1/4″ or so of the meat and skin. Place the extra potato in a separate bowl. Bake the scooped-out skins at 400 degrees for about 15 -20 minutes. To your bowl of potatoes, and add 3 tablespoons of unsweetened almond milk and 1 tablespoon of nutritional yeast. Stir with a fork until creamy and smooth. Spoon about 1 tablespoon of the filling back into each potato half. Then you want to kind of mound a tablespoon or so of the veggies onto the filing, kinda smooshing them down so they stick. Yeah that’s a technical word – smooshing. At this point I had also already chopped 2 small tomatoes, so here I added some tomato pieces too. And finally I shook on some Vegan Parmesan. Now were starting to look like Pizza Stuffed Potatoes! Yum! Put these bad boys back into the oven for another 5-10 minutes and cook until heated through and the parmesan gets a little toasty. If you’ve never had Vegan Parmesan before, I have to tell you this stuff is amazing. It’s crumbly and a bit salty, just like the real thing, but the cashews add some all-importantTbs fiber not to mention a little iron, potassium, and magnesium. And it’s dairy free with only the healthy fat. Add all the ingredients to a blender, chopper, or food processor and blend until uniform and powdery. Wow – thanks everyone for the nominations. I will gladly accept one of them, and respond in kind, once I finish my work week! This coming week is my long week at work so I’m not going to be able to get to this until Sun or Mon. I was flattered that both of you would give me the same nomination. Thanks! I’ve just been reading through your potato recipes, and right before this one I was reading about hash brown waffles and smushed baked potato waffles, and thought one of those might work as a base for a pizza as well. I’ll have to try it soon! I miss pizza. ? but now I can have a much healthier version! ?